I heard somewhere that you can tell whether a book is good or not from the first sentence, and the first sentence in “I’ll Always Be with You” by Violetta Armour absolutely blew me away. I knew immediately I was its hostage, and in fact, I never put the book down until I finished the very last sentence. Sixteen-year-old Teddy has to live with the memory and guilt of the death of his father, Stan, as the result of a fatal auto accident. The entire family is struggling with the loss, but Mary is especially concerned for her son Teddy, who feels he is at fault. Mary intends to put as much distance between her family and the fatal intersection that will always be a painful reminder of what happened, by moving to Stan’s small hometown in Indiana, to be with his mother, Baba, and the rest of the family. Living in the childhood home of their father, surrounded with love from Baba and his Uncle Dan, Teddy begins the slow process of healing. One day in Baba’s attic Teddy finds an old book his great-grandfather carried with him to America. Baba tells him it is a book that Bulgarian fathers have always read to their sons, and Teddy finds inspiration in reading the book, it almost seems like his father is talking to him through the pages. While Teddy is on his journey of healing and rediscovery, Mary is also finding her way, and gets a job in the local bookstore. There she meets several people who knew Stan, including Rosetta, who Mary discovers was secretly Stan’s high school sweetheart. Mary learns of the forbidden love Stan and Rosetta shared during the Civil Rights Movement, and how they dared to reach out for love across racial lines. Now, as the events of the past unfold and lives intertwine, difficult choices must be made. Can Mary and Rosetta rise above the events leading up to these moments and choose happiness for their families, or will they dwell in the past? The story is told in the alternating voices of Teddy, Mary and Rosetta, with the background story of Stan and Rosetta in the middle. Told in this manner, the story becomes even more profound as the reader is invited directly into the minds and hearts of each character, almost like reading three separate stories, which indeed, is the case. It is a well-written, well-told heartfelt saga, with references to some of the most important events in American history that shaped the world as we know it today. The author has a wonderful storytelling gift and I eagerly connected with each of the characters, celebrating their highs moments and being empathetic to their struggles as they dealt with and pushed through their grief. 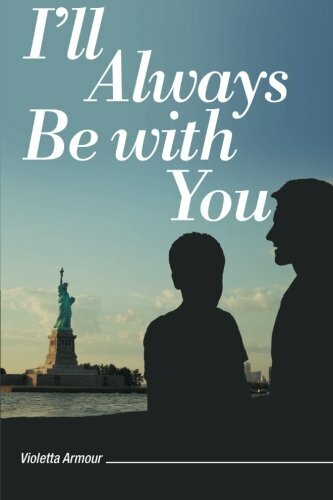 "I’ll Always Be with You" is an inspiring tale of love, loss and renewal and reads much like a story from a seasoned author, which is why I highly recommend this story from debut author, Violetta Armour. If this is the kind of work she puts out on her first go-round, I can’t wait to see what she has in store next!